Rui Hachimura is considered the best basketball talent Japan has ever produced. Usually, a fan favorite is a player who tantalizes with his talent or works hard to be a spark plug off the bench. Rui Hachimura is that rare bird who does both. It's hard to gauge which draws a louder roar from Gonzaga fans: Hachimura simply checking into the game or the inevitable moment, soon after, when he destroys the rim with a highlight-reel dunk. The 6-foot-8 sophomore forward has a penchant for big plays and dominant performances, but comes across as a soft-spoken sweetheart off the court. Which no doubt helped endear him to the fans who won him over in the first place. "Everybody here is really kind, you know," Hachimura says. "I don't know how to describe it. I think that's one of the reasons I chose to come here. I went to visit other colleges too, but when I came here I felt really comfortable." The value of finding comfort more than 5,000 miles from home cannot be overstated. 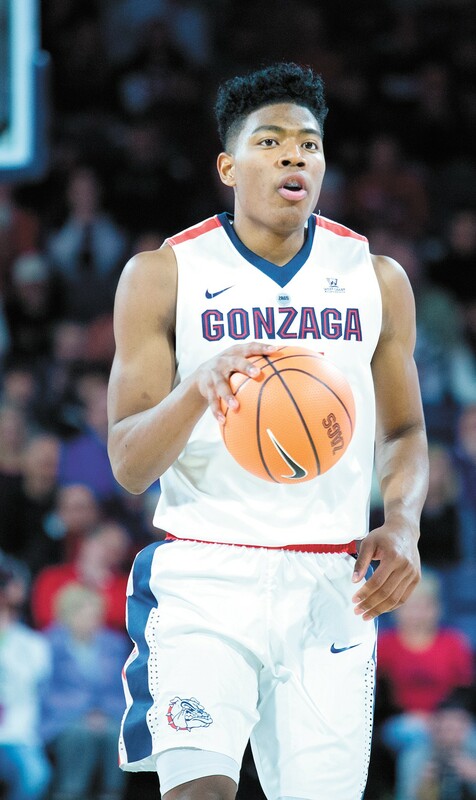 Hachimura came to Gonzaga from Toyama, Japan. When he committed to the program in 2015 he was still learning English. Even now, as a sophomore in college with strong English skills, Hachimura largely avoids the media. But that doesn't keep the press from trying. There were more than a dozen credentialed media members from Japanese outlets at this year's West Coast Conference tournament in Las Vegas. They were there for one player: The best basketball talent Japan has ever produced. "Of course I'm from Japan and people know about me," Hachimura says. "There are a lot of fans, I guess." Averaging 11.3 points and 4.6 rebounds per game this season, despite coming off the bench, Hachimura's fan base is growing rapidly on both sides of the Pacific. Fans in Japan and Spokane have known, for a while now, what NBA fans will soon learn. Rui Hachimura is really good at basketball. Good enough to leave Gonzaga early and head to the pros. When asked what would get his vote for best of the Inland Northwest, Hachimura perhaps tipped his hand regarding his future. "The weather in the summer," Hachimura says. "Here it's only sunny." Maybe he'll stay for another season, maybe not. Either way, Hachimura's future is bright. The original print version of this article was headlined "RUI HACHIMURA"